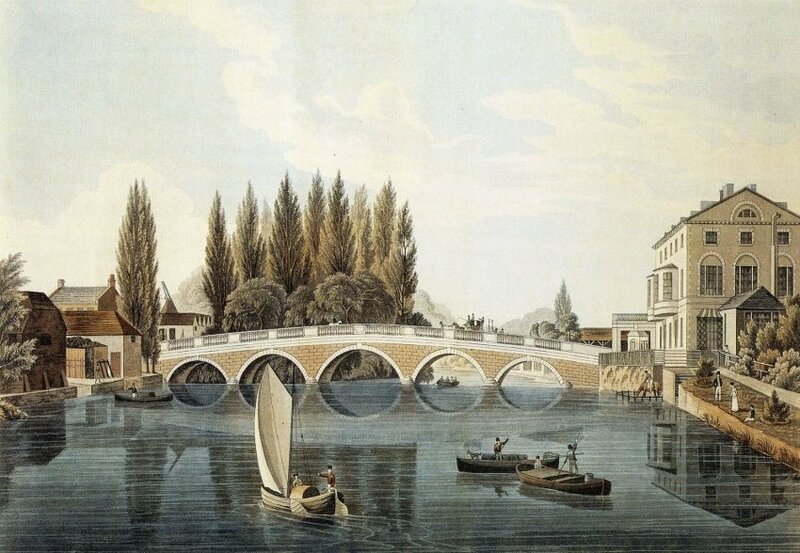 This fine view of the Town Bridge is attributed to J H Matthiason, author and illustrator of Bedford & its Environs (1831), but it is more likely to be the work of the engraver R C Havell. Matthiason’s own drawings, reproduced in his amusing but historically inaccurate book, are of poor quality. The view shows the Town Bridge, designed by John Wing and opened in 1813, from the downstream (east) side. Horse riders, carts, coaches and carriages had to pay a toll until 1835. The road known as The Embankment was not built alongside the Swan Hotel until after 1860. Green's Coal Wharf can be seen on the left (south) bank. The two boats being poled are 'Fen lighters' used for carrying goods along the Ouse up to Bedford. See "The Rise & Fall of the Ouse Navigation to Bedford" Bob Ricketts. Bedford Local History Magazine 94 October 2014.